2x 40-Pin IDC female sockets. Length: 18 inches. Type: ATA33 IDE Flat Ribbon Cable. Gauge: 28 AWG. stranded core. Conductors: 40. Insulator Material: PVC. 3x 40-Pin IDC female sockets. Length: 24 inches. 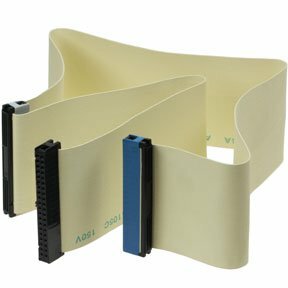 Type: ATA33 IDE Flat Ribbon Cable. Gauge: 28 AWG. stranded core. Conductors: 40. Insulator Material: PVC. 3x 40-Pin IDC female sockets. Length: 36 inches. Type: ATA33 IDE Flat Ribbon Cable. Gauge: 30 AWG. stranded core. Conductors: 40. Insulator Material: PVC. 5x 40-Pin IDC female sockets. Length: 48 inches. Type: ATA33 IDE Flat Ribbon Cable. Gauge: 28 AWG. stranded core. Conductors: 40. Insulator Material: PVC. Type: ATA100 Flat IDE Cable. Length: 36 inches. 3x 40-pin Female. Conductors: 80. Type: PVC ATA 66 BUS Cable. Length: 18 inches. IDC 40 x 3. Type: PVC ATA 66 BUS Cable. Length: 36 inches. IDC 40 x 3. Type: ATA100 Flat IDE Cable. Length: 18 inches. 3x 40-pin Female. Conductors: 80. IDE Cables are used to connect some hard drives and optical drives to each other and to the motherboard. You can find good quality IDE cables at SF Cable. You can choose from IDC internal dual drives, Floppy Round cables, Drive Flat IDE Cables, Drive flat IDC Cables, TPO Ultra ATA BUS Cables, PVC ATA BUS Cables, and many other products. All products are available with different specifications. Sourced directly from the manufacturers, our products are offered at very competitive rates. Quality and safety is our first priority. We also provide good after sales service and lifetime technical support on our products.